During winter in Alaska, the wood frog (Rana sylvatica) freezes so that it looks like a frog-shaped piece of ice. While frozen, the frog stops breathing, its heart stops beating, its blood stops flowing, and it cannot move.1 However, when spring arrives, the frog’s body thaws and the frog returns to normal life. This is an amazing feat that would certainly be highly unlikely to have developed by chance. To restart the function of the frog’s systems after they have been frozen requires extremely complex genetic programming. The adult wood frog, which grows to be only about 8 cm (3 inches) long, has an unusual colouration on its face that makes it look like it is wearing a black mask. The frog lives in Canada and also in the United States from Alaska to Alabama.2 In Alaska, wood frogs inhabit diverse environments, from grasslands to forests, muskegs3 and tundra.4 The wood frog is one of only three species of frogs that live north of the Arctic Circle. This remarkable ability of the wood frog to survive being frozen has inspired some people to believe that human beings, or at least some of their organs, can be frozen and eventually brought back to life.13 Whether this is possible or not remains to be seen. For the ability to survive being frozen to have happened by chance through random and accidental mutations via natural selection would truly be incredible. Rather, it speaks of creative genius. God created the earth to be inhabited (e.g. Genesis 1:22), so it would make sense in his foreknowledge to create creatures with the capacity to adapt to the various environments that would occur. The Ice Age that developed after the Flood would have created areas where only frogs that were freeze-resistant could live. There are several species of freeze-resistant frogs. At least one unique gene is involved, which codes for a 390-amino-acid protein in the livers of Rana sylvatica, Pseudacris crucifer and Hyla versicolor, but not in non-tolerant species of Rana, for example.1 The freeze-tolerant species come from at least two different families—Hylidae and Ranidae in the suborder Neobatrachia of the frog order, Anura.2 Most other members of the families represented are not able to tolerate freezing conditions. What does this say about the original created frog, around 6,000 years ago? Was there an original created kind, today represented by the sub-order Neobatrachia, from which all the current freeze-tolerant types have descended, with loss of the ability in most other members of the same genera / families? This is possible. The ready hybridization of many frog species suggests that the created kind falls at or above the level of family. The diversity we see today could be partly due to a range of frogs surviving outside Noah’s Ark—the wide geographic distribution today of so many frog families suggests this. McNally, J.D., et al., Freeze-induced expression of a novel gene, fr47, in the liver of the freeze-tolerant wood frog, Rana sylvatica, Biochim. Biophys. Acta 1625(2):183–191, 2003. A common classification system, as used at <tolweb.org/Neobatrachia/16987>, although systems vary considerably. Hoegg, S., et al., Phylogeny and comparative substitution rates of frogs inferred from sequences of three nuclear genes, Molecular Biology and Evolution 21(7):1188–1200. Frog, <en.wikipedia.org/wiki/Frog#Taxonomy>, 6 September 2006. From a frog to a … frog! Wood Frog, <en.wikipedia.org/wiki/Rana_sylvatica>, 21 October 2005. Return to text. Wood Frog, Rana sylvatica, US Geological Survey, Northern Prairie Wildlife Research Center, <www.npwrc.usgs.gov/narcam/idguide/wood1.htm>, 21 October 2005. Return to text. A muskeg is a swamp or bog formed by an accumulation of sphagnum moss and decayed matter resembling peat. Return to text. Broderson, K., Frogs and toads, Alaska Department of Fish and Game, <www.adfg.state.ak.us/pubs/notebook/amphibia/amphib.php>, 21 October 2005. Return to text. Grzimek’s Animal Life Encyclopedia, 2nd edition, Volume 6, Amphibians, edited by Hutchins, M., Duellman, W.E. 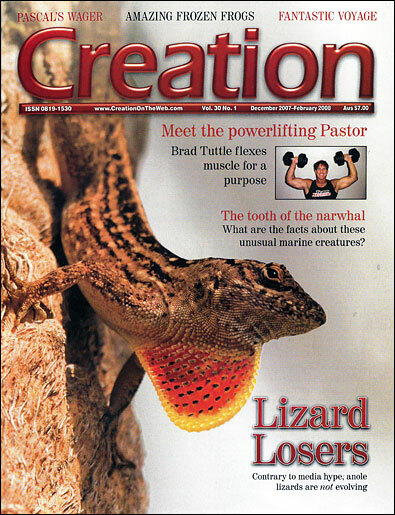 and Schlager, N., Gale Group, Michigan, USA, p. 63, 2003. Return to text. Denali 2005 Fact Sheet, Denali National Park and Preserve, US Department of the Interior, <www.nps.gov/dena/home/mainpagefiles/2005%20Facts.pdf>, 21 October 2005. Return to text. The Wood Frog, Rana sylvatica, Canada’s Polar Life, Animals, Arctic amphibians, <www.arctic.uoguelph.ca/cpl/organisms/frog_intro.htm>, 25 October 2005. Return to text. Ref. 2. Without the ‘antifreeze’, ice crystals would form and these would damage the cells and kill the frog. Freezing of extremities in humans causes frostbite, involving death of the affected tissues. Return to text. Ref. 4. Return to text. Kiehl, K., Rana sylvatica, Animal Diversity Web, University of Michigan Museum of Zoology, <animaldiversity.ummz.umich.edu/site/accounts/information/Rana_sylvatica.html>, 21 October 2005. Return to text. Wood Frog, BC. 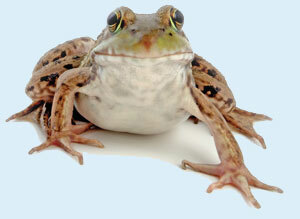 Frogwatch Program, Ministry of Environment, Government of British Columbia, <wlapwww.gov. BC.ca/wld/frogwatch/whoswho/factshts/woodfrog.htm>, 21 October 2005. Return to text. Svoboda, E., Waking from a dead sleep, Discover 26(2):2021, February 2005. Return to text. 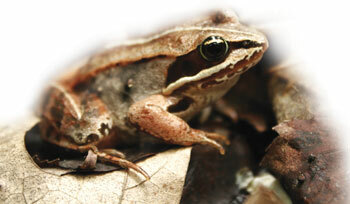 Cai, Q. and Storey, K.B., Freezing-induced genes in wood frog (Rana sylvatica): fibrinogen upregulation by freezing and dehydration, Journal of Applied Physiology Online, <ajpregu.physiology.org/cgi/content/abstract/272/5/R1480>, 21 October 2005.